I thought I would paint a pumpkin sitting on a dock post to commemorate the arrival of autumn. I added all kinds of colors to the trees and fallen leaves as well, which go together nicely. Fall is one of my favorite times of the year! I plan on also painting a winter scene to celebrate Christmas this year! 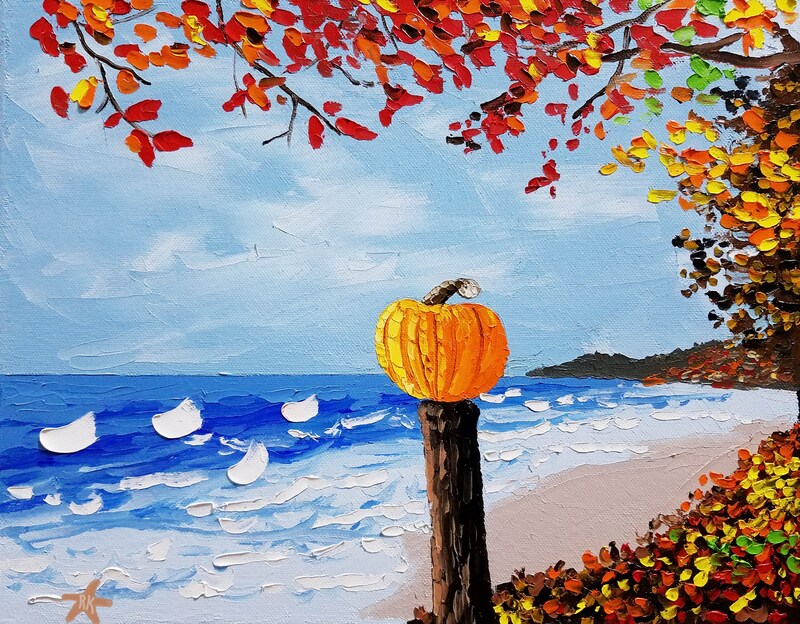 **This autumn art was painted with oil paints, using only palette knives! It was created on high quality cotton canvas and is stretched and ready to hang. The sides of the oil painting are painted *black* to give the art a professional look. You can hang it right out of the box! **This original artwork is 11 by 14 inches in size and comes with a certificate of authenticity, signed by me. The colors and rich textures of the painting make the work pop off the canvas. My 3-D style is very exciting and makes my art unique.